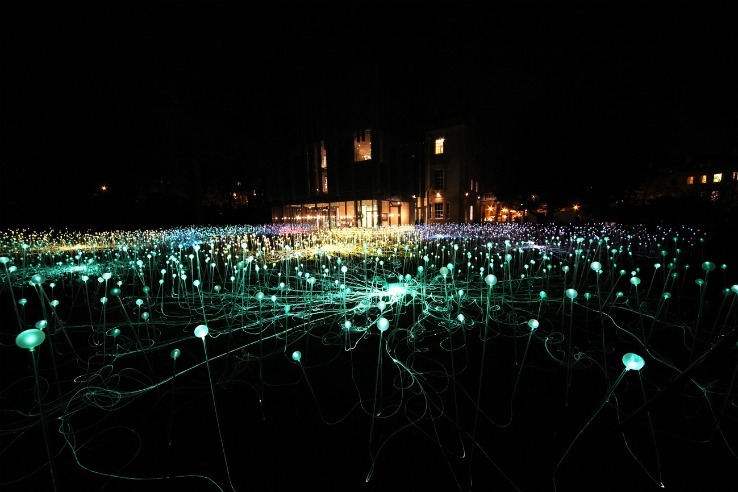 Artist Bruce Munro's stunning light gardens are glowing topographies of led lights, fiber optics and projectors that sparkle in the night. We've covered these beautiful displays of energy-efficient lighting in the past, and the artist's latest installation is a fresh new Field of Light at the Holburne Museum in Bath, UK - read on for a closer look! This installation includes over 5,000 frosted acrylic orbs that are connected via a series of fiber optic cables to a color-scrolling projector. The orbs are circuited in clusters, so that groups of orbs will shift in color. In the evening hours the artwork causes the land around the museum to light up like high-summer firefly season. A mass of fiber optic cable snakes out to each individual stem in a surreal root-like networking system. The field is lit every evening for three hours, from 4pm – 7pm. A few acrylic stems are installed in the museum as well, echoing the installation of the glowing field outside. We’re entranced by Munro’s ability to transform landscapes, and are waiting with much anticipation for his installation at Longwood Gardens in Pennsylvania, which will include 20,000 orbs with internal fiber optics. Featuring over 5000 acrylic stems, the installation of "Field of Light" changes according to its landscape. For this particular incarnation, Munro was inspired by previous travels through the Australian Red Desert, which has fast stretches of isolation broken up by animated roadside cafes. Says the Museum: "Munro was transfixed by the way the red desert was barren until it rained and then, as if from nowhere, dormant seeds would burst into bloom. He made a series of sketches in the notebook carried in his pocket since his student days, and the idea refused to dislodge from his mind. " 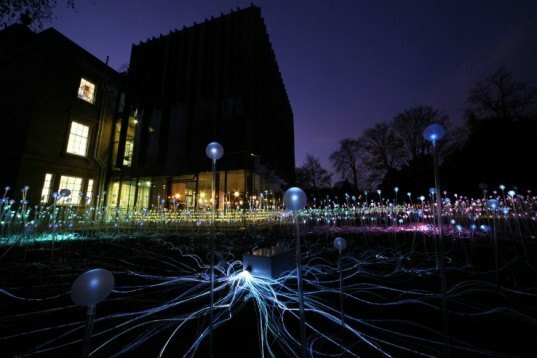 A mass of fiber optic cable snakes out to each individual stem in a surreal root-like networking system. The field is lit every evening for three hours, from 4pm-7pm. A few acrylic stems are installed in the museum as well, echoing the installation of the glowing field outside. Munro is also preparing for a large-scale installation at Longwood Gardens in Pennsylvania in 2012, which will include 20,000 stems and internal fiber-optic coils.